The following plan for integrating unmanned aircraft systems into the National Airspace System was released by the FAA on November 7, 2013. Since the early 1990s, unmanned aircraft systems (UAS) have operated on a limited basis in the National Airspace System (NAS). Until recently, UAS mainly supported public operations, such as military and border security operations. The list of potential uses is now rapidly expanding to encompass a broad range of other activities, including aerial photography, surveying land and crops, communications and broadcast, monitoring forest fires and environmental conditions, and protecting critical infrastructures. UAS provide new ways for commercial enterprises (civil operations) and public operators to enhance some of our nation’s aviation operations through increased operational efficiency and decreased costs, while maintaining the safety of the NAS. The FAA created the Unmanned Aircraft Systems Integration Office to facilitate integration of UAS safely and efficiently into the NAS. Toward that goal, the FAA is collaborating with a broad spectrum of stakeholders, which includes manufacturers, commercial vendors, industry trade associations, technical standards organizations, academic institutions, research and development centers, governmental agencies, and other regulators. Ultimately, UAS must be integrated into the NAS without reducing existing capacity, decreasing safety, negatively impacting current operators, or increasing the risk to airspace users or persons and property on the ground any more than the integration of comparable new and novel technologies. Significant progress has been made toward UAS-NAS integration, with many challenges and opportunities ahead. A key activity of the FAA is to develop regulations, policy, procedures, guidance material, and training requirements to support safe and efficient UAS operations in the NAS, while coordinating with relevant departments and agencies to address related key policy areas of concern such as privacy and national security. Today, UAS are typically given access to airspace through the issuance of Certificates of Waiver or Authorization (COA) to public operators and special airworthiness certificates in the experimental category for civil applicants. Accommodating UAS operations by the use of COAs and special airworthiness certificates will transition to more routine integration processes when new or revised operating rules and procedures are in place and UAS are capable of complying with them. The FAA has a proven certification process in place for aircraft that includes establishing special conditions when new and unique technologies are involved. This process will be used to evaluate items unique to UAS. In those parts of the NAS that have demanding communications, navigation, and surveillance performance requirements, successful demonstration of UAS to meet these requirements will be necessary. The process of developing regulations, policy, procedures, guidance material, and training requirements, is resource-intensive. This roadmap will illustrate the significant undertaking it is to build the basis for the NAS to transition from UAS accommodation to UAS integration. Government and industry stakeholders must work collaboratively and apply the necessary resources to bring this transition to fruition while supporting evolving UAS operations in the NAS. 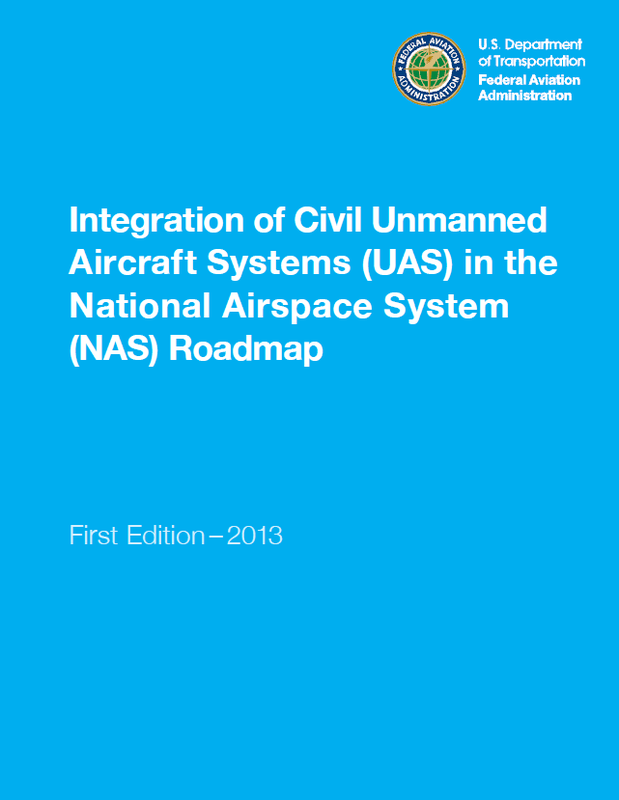 The purpose of this roadmap is to outline, within a broad timeline, the tasks and considerations needed to enable UAS integration into the NAS for the planning purposes of the broader UAS community. The roadmap also aligns proposed Agency actions with the Congressional mandate in the FAA Modernization and Reform Act of 2012, Pub. L. 112-95. As this is the first publication of this annual document, the FAA will incorporate lessons learned and related findings in subsequent publications, which will include further refined goals, metrics, and target dates. The FAA is committed to the safe and efficient integration of UAS into the NAS, thus enabling this emerging technology to safely achieve its full potential. Numerous Air Traffic products, policies, and procedures also need to be reviewed and refined or developed through supporting research to permit UAS operations in the NAS. The UAS Integration Office coordinates efforts with the ATO to complete these tasks. • And reviewing environmental requirements (e.g., the National Environmental Policy Act). The FAA recognizes that current UAS technologies were not developed to comply with existing airworthiness standards. Current civil airworthiness regulations may not consider many of the unique aspects of UAS operations. Materials properties, structural design standards, system reliability standards, and other minimum performance requirements for basic UAS design need to be evaluated against civil airworthiness standards for existing aircraft. Although significant technological advances have been made by the UAS community, critical research is needed to fully understand the impact of UAS operations in the NAS. There has also been little research to support the equipment design necessary for UAS airworthiness certification. In the near- to mid-term, UAS research will need to focus on technology deemed necessary for UAS access to the NAS. As UAS are introduced, their expected range of performance will need to be evaluated for impact on the NAS. UAS operate with widely varying performance characteristics that do not necessarily align with manned aircraft performance. They vary in size, speed, and other flight capabilities. Similarly, the issue of performance gap between the pilot and the avionics will impact NAS operations. For example, a quantitative time standard for a pilot response to ATC directions (such as “turn left heading 270, maintain FL250”) does not exist – there is an acceptable delay for the pilot’s verbal response and physical action, but there is no documented required range of acceptable values. Avionics that perform the corresponding function cannot be designed and built without these performance requirements being established. • The UAS pilot must depend on a data link for control of the aircraft. • And some UAS launch and recovery methods differ from manned aircraft and require manual placement and removal from runways, a lead vehicle for taxi operations, or dedicated launch and recovery systems. • “Sense and Avoid” (SAA) capability must provide for self-separation and ultimately for collision avoidance protection between UAS and other aircraft analogous to the “see and avoid” operation of manned aircraft that meets an acceptable level of safety. SAA technology development is immature. In manned flight, see and avoid, radar, visual sighting, separation standards, proven technologies and procedures, and well-defined pilot behaviors combine to ensure safe operation. Unmanned flight will require new or revised operational rules to regulate the use of SAA systems as an alternate method to comply with “see and avoid” operational rules currently required of manned aircraft. SAA system standards must be developed to assure both self-separation and collision avoidance capability for UAS. Interoperability constraints must also be defined for safe and secure interactions between SAA-enabled UAS and other airborne and ground-based collision avoidance systems. While SAA may be an independent system, it must be designed to be compatible across other modes (e.g., ATC separation services). See Appendix C.3 and C.4 for specific goals and metrics. 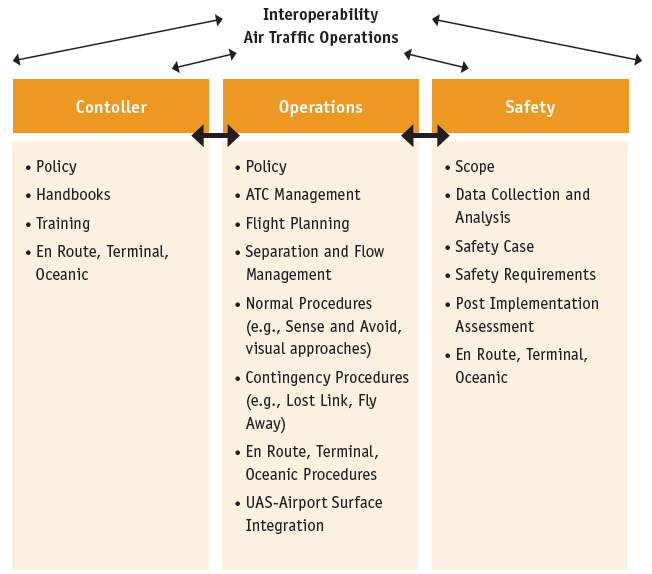 • Control and Communications (C2) system performance requirements are needed and RTCA is developing consensus-based recommendations for the FAA to consider in C2 policy, program, and regulatory decisions. The resulting C2 requirements need to support the minimum performance required to achieve higher-level (UAS level) performance and safety requirements. Third-party communication service providers are common today (e.g., ARINC, Harris, etc.) and the FAA has experience with setting and monitoring performance of third parties. The use of third parties is dependent on the UAS architecture chosen, but these are still being evaluated in terms of feasibility from a performance, cost, and safety perspective. See Appendix C.5 for specific goals and metrics.